Get ready to measure, mix, and decorate! 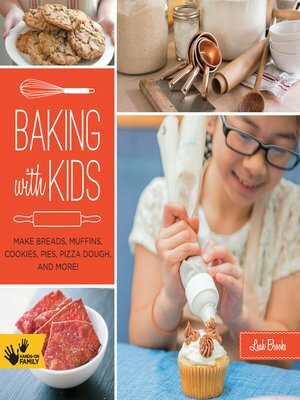 Baking with Kids is just the book you need to help teach children to bake. Show your children how to safely use basic equipment in the kitchen and explain all about the important ingredients they’ll need to make the most delicious baked goods. Recipes include muffins, scones, breads, pretzels, crackers, pizza dough, pie crust, cake, cookies, cupcakes, and more! Celebrated chef and instructor, Leah Brooks creates activities with simple step-by-step photo illustrations that will guide kids through each recipe and inspire creativity throughout. Put on your aprons—it’s time to get baking! This entry was posted in eBook Friday and tagged cooking & food, eBooks. Bookmark the permalink.